There is so much so wrong with this statement, not least Durkin’s apparent indifference or obliviousness, to what are, often, preventable deaths. What really makes my jaw ache though is his bizarre reference to families of learning disabled and mental health patients. Mike, all families should be properly treated and supported when a loved on has died unexpectedly. Just like all unexpected deaths should be properly investigated. Singling out these families suggests a complete misunderstanding of this latest scandalous unfolding. Also, before you make a leap to global standards of excellence, you might want to see what’s going on in Spain and their response to the way in which the NHS treat certain members of society. Strikes me, you could learn a thing or two. 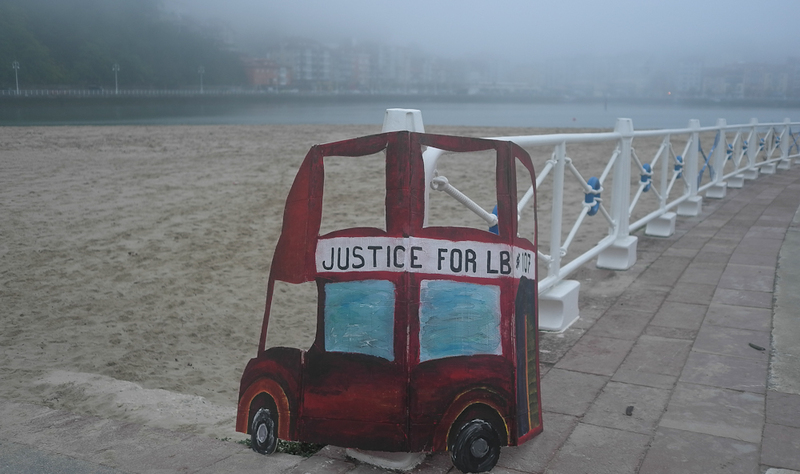 Today, as part of the International Day of Persons with Disabilities, Learning Disability England and Spanish friends held an event in Aviles, Northern Spain, celebrating #JusticeforLB and all those who have died through neglect and indifference. Stitching, artwork, music, dancing, fun and so much more. Valued members of society. Blimey. ‘Reach for the stars’ type aspirations that seem to firmly remain the stuff of dreams here. Despite the continued and brilliant efforts of some/many. Still. We gotta recognise steps made and there have been some. First, the General Medical Council (GMC). Having proceeded at a snails pace (over 2.5 years so far) in the investigation of Dr M, we were told we’d hear the case examiner decision this week. Sitting at my desk earlier [grey sky, gloominess and an all to0 familiar feeling of delay dread] I steeled myself for another weekend without news. Then an early afternoon email. Dr M is being referred to a tribunal hearing. A few hours later, a comprehensive (and spontaneous) update from the Health and Safety Executive (HSE) beautifully headed ‘Connor’. If you’re embroiled in a serious investigation involving a preventable death [howl], your priorities may well be on the meticulous steps involved in evidence collation/examination. Keeping families informed may seem a less relevant, smaller, almost inconsequential part of the process. that beyond loved children/sisters/brothers/grandchildren/nephews/nieces/friends are valued. serious consideration and scrutiny of what’s happened, allowing/enabling slightly easier rest in a harrowing (possibly lifelong) space. a basic, deeply warming, and too often missed, humanity. Thank you. 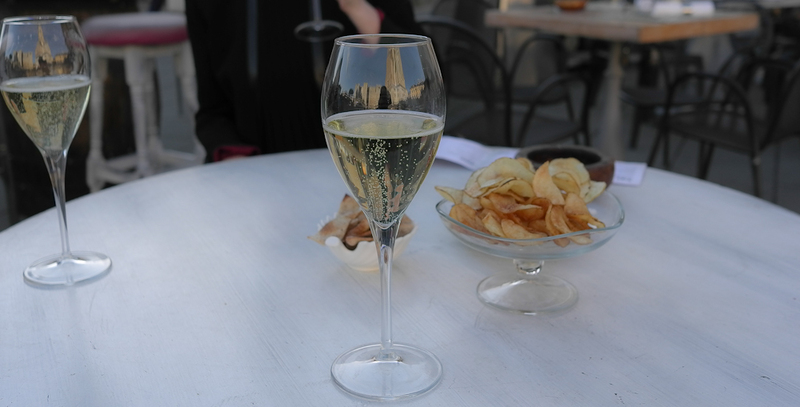 To the GMC, HSE and ongoing Spanish based magic. For shining light and sunshine on the way forward. You can join, contribute to and keep up with Learning Disability England for £12 a year. The #CaminoLB. Following the back end of a yellow shell for 8 days across the Northern route of the Camino de Santiago. 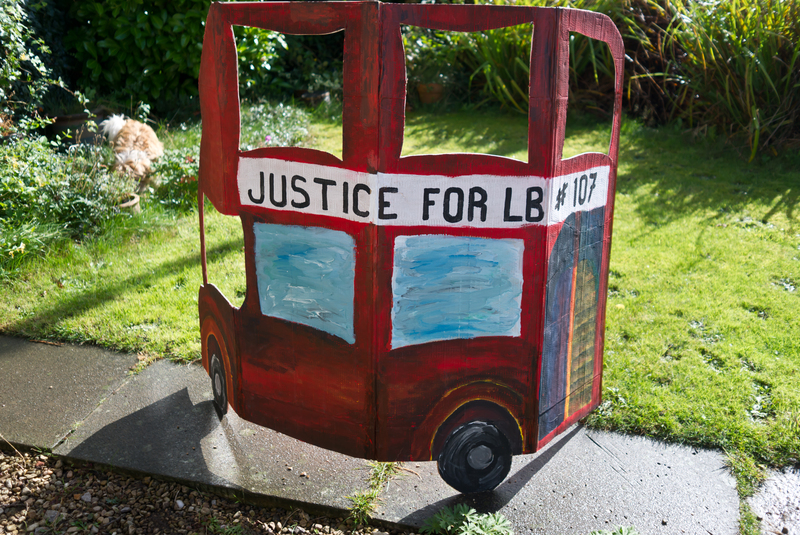 Carrying the cardboard #JusticeforLB bus (made by the Boumelha family) to Aviles for an exhibition to be held on December 2. 160 kms of beautiful and constantly changing scenery (beaches, forests, mountains, towns, hamlets, woods, lakes, estuaries) and pathways (cliff paths, foot paths, dirt and gravel tracks, tiled sections, alongside dual carriageways, roads and railways). A backdrop of fresh air (with delicious whiffs of eucalyptus, rotting hay, mint, fig, lemon, orange and hazelnut trees). Constant and unexpected sunshine sometimes blocked by sea mist. Still trying to remember what joker told me the Northern Camino was pretty flat. Or maybe I dreamed it among the low level anxiety before we set off. Learning disabled people can’t walk (far?) was a message communicated to us in a meeting a few weeks before we set off. We’d crowdsourced £2k [thank you] to fund a group from My Life my Choice to join us for part of the journey. 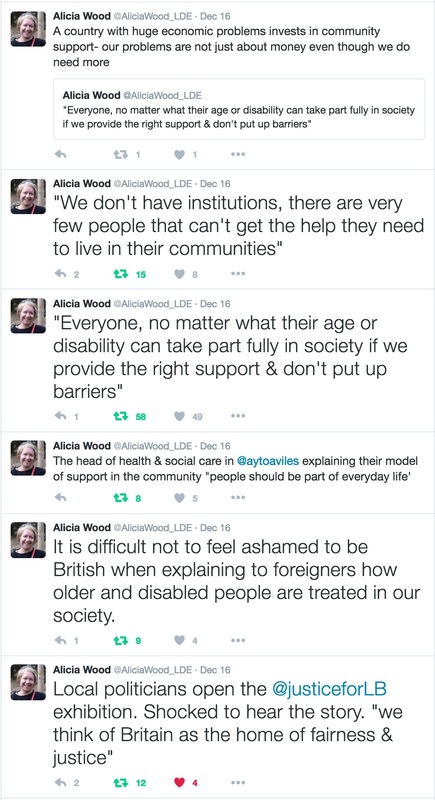 Sadly the language of social care diffused into everyday talk to threaten what was, essentially, a walking holiday. ‘Public liability insurance’, ‘support vehicles’ and the like, as ever working to bleakly colour and constrain the lives of so many people in the UK. As it was, we walked (miles), talked, ate delicious nosh, drank beer and cider, slept in dorms and laughed. The biggest [unanticipated] risks were snoring, farting, bangle wearing, decisions around the use of ‘she wees’ (we didn’t) and cheeks that ached more than legs because of hilarious contributions from John and Dave and, later, Dawn and Shaun. Fifteen people and two Great Danes pitched up at different points along the walk, facilitated by the extraordinary efforts of Mariana Ortiz, Alicia Woods and Henry Iles. We met all sorts of people en route intrigued by the bus. More officially we met members of a Spanish charity, Integra, and were welcomed at town hall receptions in Gijon and Aviles. A scruffy, cheerful bunch, carrying the battered but still brilliant cardboard bus, greeted by immaculately turned out dignitaries, film crews and photographers. Visible shock and horror expressed at the deaths of LB, Danny (Rosie Tozer’s son), Thomas, Nico and others. Reflection and clarity completely missing from public office/sector in the UK where LB, Danny and others were simply budgets and burdens. And snatched moments of contemplation along the way. The enormity of why we were walking the Camino constantly with us. It was fitting that the walk coincided with the Dia de Todos Los Santos (Day of the Dead) on November 1. We marked this with (non risk assessed) late night candle lighting and tears on the beach. With an irony meter the size of the hills we were regularly scaling, I ‘learned’ a shedload during this adventure. The biggy [howl] was the realisation (or more accurately, recognition) of how I let LB down. No – no – response to this please (and don’t even go there Sloven, NHS Improvement, Jezza, NHS England, CQC, Health and Safety Executive and the like…) He was waiting for me to bring him home and I didn’t. I also realised, or maybe recognised more clearly, that you just have to crack on and do stuff. Ditch the doubt, walk away from the blight that is big charity (non) work/public sector shite in the area of learning disability and just do stuff. Mencrap, NAS, Scope and other money spinning waste of space bastards totally miss the point. The conversations, chat, discovery, self reflection, delight and joy we shared/experienced across the journey – among those walking, people we met, and virtual campaigners – underlined this. Those who should do, simply ain’t going to. In the UK, anyway. Spending time with Dawn, Shaun and Paul generated insights into life as a learning disabled adult. Dawn’s stories of living in a Mencrap home in the past were harrowing and her comment after an uncharacteristic stern moment – ‘Oh, I’d make a good carer’- was chilling. I was surprised at how far we were able to walk. And the absence of complaint. There were some struggles, a few blisters and chafing (a story for another day). 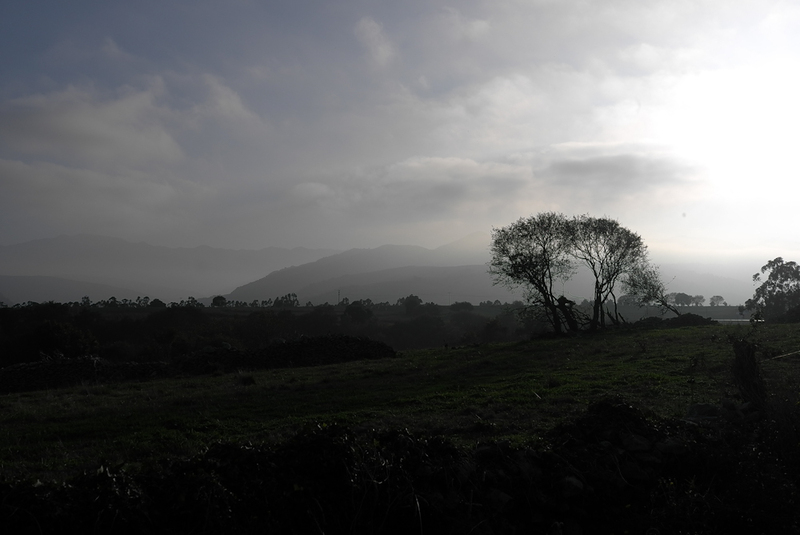 Endless uphill walks or clambering down rocky, chestnut and wet leaf strewn paths. I worried about the pain the walk would inevitably involve – I ain’t no walker – but it didn’t materialise. I wouldn’t advocate not training for a substantial walking trip but clearly backbone, guts and resilience go a long way. Whatever it was. It worked. Not long to go now before we set off on the CaminoLB. The route is here (it’s a bit anarchic organic and loosely formed). What we know so far: George Julian, John Williams, Dave Griffiths and I (me?) are setting off on Tuesday evening on the 24 hour ferry from Portsmouth to Santander. 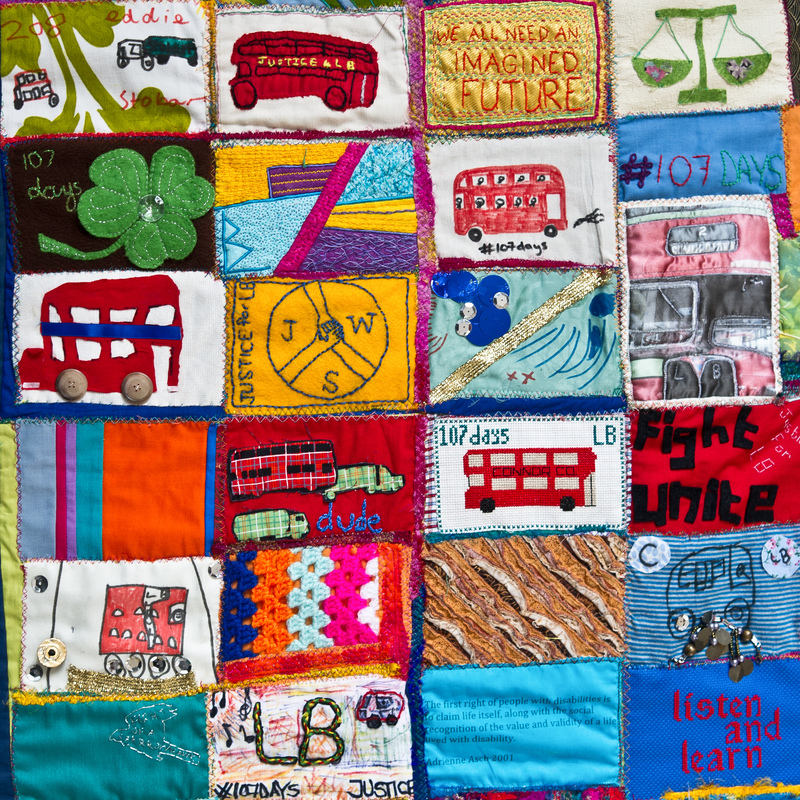 With the #JusticeforLB quilt and bus. 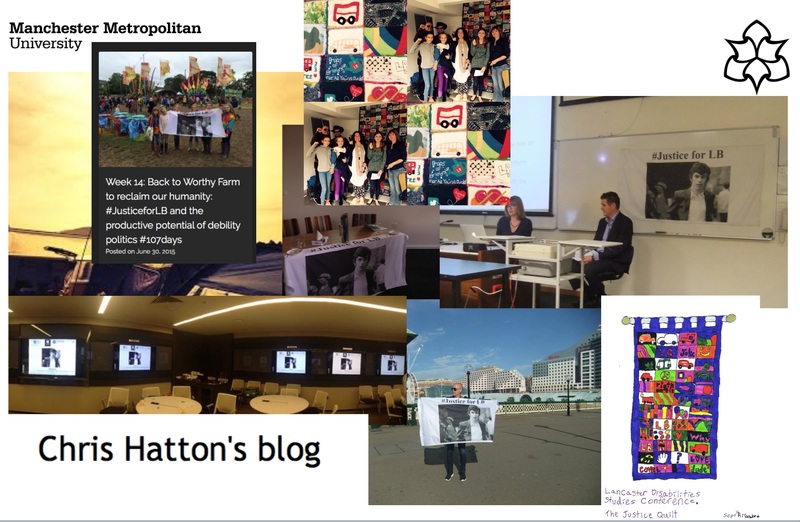 Postcards of Awesome, the #JusticeforLB flag and anything else we can tuck in our pockets and socks. 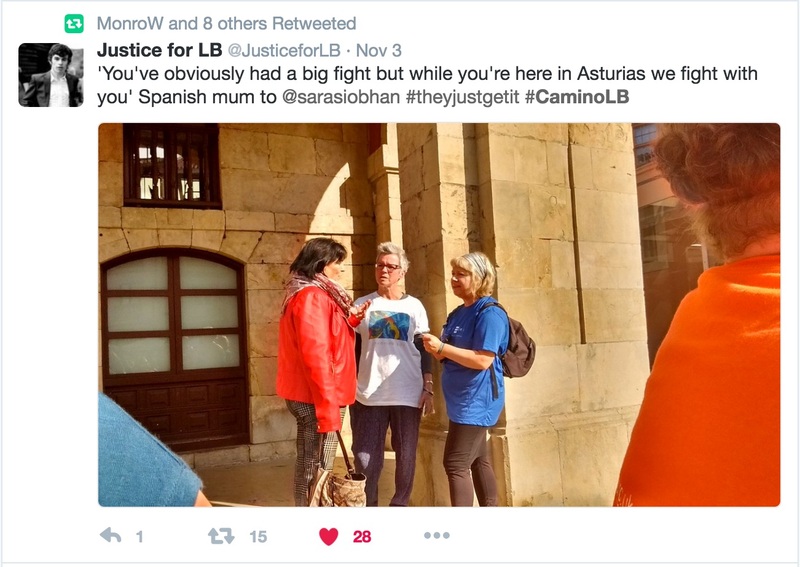 We hand the booty (other than the bus and the flag if I can find it) over to Alicia Wood in Santander in advance of the #JusticeforLB exhibition planned for 2 Dec. We start walking with the bus first thing Oct 27 with a cheeky 37 miles to cover in the first two days. Luckily John and Dave are doing those two days. Two comedians who are planning to train by doing a few laps of the deck on the ferry. John has Body Glide anti-chafe cream and Compeed. Dave will be wearing his crown. Various people will join us along the route. With a build up across the final three days when five people from My Life My Choice (including Dawn Wiltshire, Paul Scarrott and Shaun Picken), Rosie Tozer, who is walking in memory of her son, Danny, and Ruth Glynn Owen join us. Paul points out that it may be the first time learning disabled people have done anything like it. I think it probably is. Demonstrating the limitations of the big charity guns – Mencap, Scope, National Autistic Society – who typically manage, orchestrate and erase the talk, enjoyment and involvement of people in a relentless drive for self promotion and self serving nothingness. We’ll be meeting with Spanish school kids who are making gingerbread figures and local dignitaries during those last three days. Finishing the walk on Nov 3 in Aviles. Dropping the bus off where the exhibition will be held in December. With the help of behind the scenes organisation magically sorted by Alicia, Mariana Ortiz and Henry Iles [thank you] we may well have the experience of a lifetime. Laughter, tears and, hopefully, more laughter. Here’s hoping a few laps of the Brittany Ferry deck on Wednesday will reap rewards. LB would bloody love it. Planning for the #CaminoLB is crackling along. We will be walking for eight days, with the long walks (around 20 miles a day) in the first five days, dropping to 10 miles maximum for the last three. [25 Oct-3 Nov]. 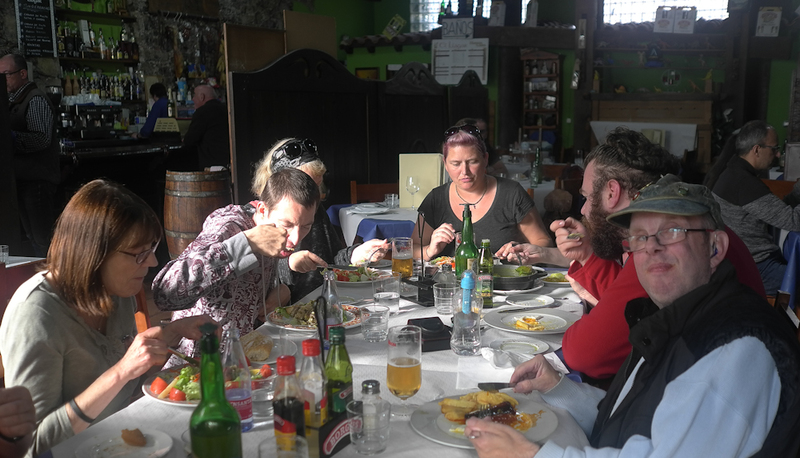 This whole, random, walking the #JusticeforLB bus across the Camino de Santiago to an exhibition centre in Aviles, has been oiled by the enthusiasm and simply can do attitude of the Learning Disability England team (with Spanish support). They not only organised the Justice exhibition, on December 2 in Aviles, which kicked off the whole thing but have stepped up to offer lifts, blister mopping, scouting the route for possible hazards, and the lovely Mariana (and her dog and possibly daughter) to ease our non Spanish speaking way. The bus, for those of you worried about us getting it from Santander to Aviles in one piece, has been carefully and lovingly strengthened by LB’s grandad and now has a nifty tarpaulin bag for those rainy days. 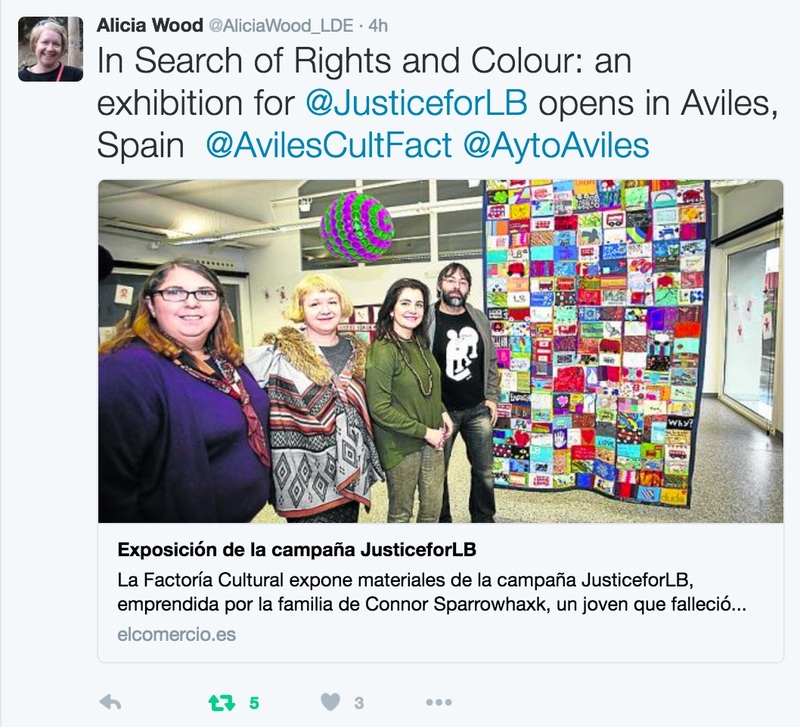 We will be a right old ragbag collective walking along the trail, in search of rights and colour. Remembering LB, Danny and the others. Carrying a cardboard bus. And hopefully having a bloody good laugh. It’s confirmed. 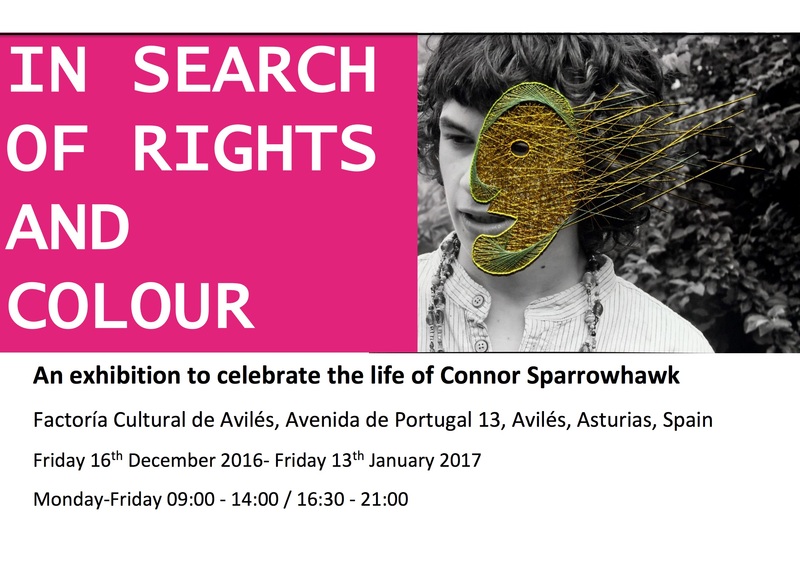 A celebration – Of Rights and Colour – organised by Learning Disability England will be held on December 2 in Aviles, Northern Spain. 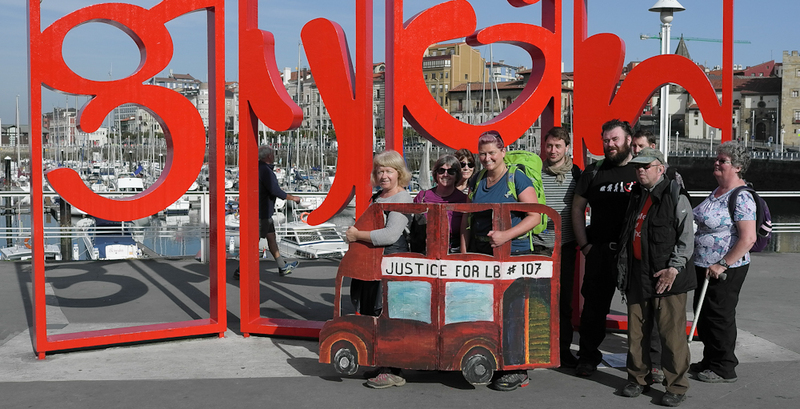 It wasn’t long before talk in the Justice shed turned to walking the #JusticeforLB bus and flag to Aviles from Santander in readiness for the event. 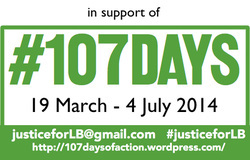 A bus made from cardboard boxes by the Boumelha family for 107days of action. And a flag that has graced two Glastonbury festivals and travelled as far as New Zealand via Sydney (meeting People First, Dunedin and the NZ Disability Rights Commissioner among others) thanks to Katherine Runswick-Cole, Rebecca Lawthom, Dan Goodley and families. But whatever. It will be a remarkable and deeply powerful experience. A time to reflect. To laugh, cry and rage. And maybe make some sense of what has happened over the past three years or so. Of rights and colour. And love.